New York City Department of Environmental Protection (DEP) Commissioner Vincent Sapienza and Department of Design and Construction (DDC) Acting Commissioner Ana Barrio today announced that a $6.8 million infrastructure upgrade in the Staten Island neighborhood of Dongan Hills has been completed. The work included the installation of storm sewers, sanitary sewers, water mains, catch basins and fire hydrants. Funding for the project was provided by DEP while DDC oversaw the construction. 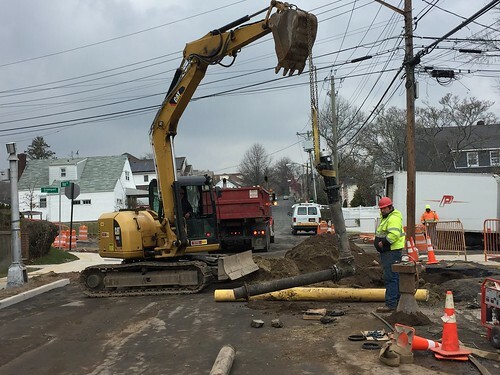 During National Infrastructure Week, DEP is highlighting the significant investments it continues to make to maintain and upgrade the City’s critical water systems. “This comprehensive new sewer system was urgently needed to improve drainage along Vista Avenue and the surrounding area, and provide a reliable source of water for fire hydrants. I want to thank Commissioner Sapienza and his team at DEP for working with me on this and many other infrastructure upgrades across my district to improve the quality of life for our constituents on Staten Island,” said City Council Minority Leader Steven Matteo. As part of the project, more than 2,400 linear feet of new storm sewers were installed along Vista Avenue, from Richmond Road to Ridge Avenue, and along portions of Mason Street and Holly Street, extending to Sparkill Avenue. The construction of 32 new catch basins will help to drain precipitation from the roadways and alleviate localized flooding. In addition, almost 1,900 linear feet of new sanitary sewers were installed. While the roadway was open to construct the sewers, approximately 4,300 linear feet of new ductile iron water mains were added to replace older cast iron pipes. This will improve water distribution in the area while 18 new hydrants will ensure firefighters have ready access to the City’s water supply. Upon completion, the roadways were resurfaced with new asphalt and 2,000 linear feet of concrete curb was installed. DEP manages New York City’s water supply, providing approximately 1 billion gallons of high quality drinking water each day to more than 9.6 million residents, including 8.6 million in New York City. The water is delivered from a watershed that extends more than 125 miles from the city, comprising 19 reservoirs and three controlled lakes. Approximately 7,000 miles of water mains, tunnels and aqueducts bring water to homes and businesses throughout the five boroughs, and 7,500 miles of sewer lines and 96 pump stations take wastewater to 14 in-city treatment plants. DEP has nearly 6,000 employees, including almost 1,000 in the upstate watershed. In addition, DEP has a robust capital program, with a planned $19.1 billion in investments over the next 10 years that will create up to 3,000 construction-related jobs per year. For more information, visit nyc.gov/dep, like us on Facebook, or follow us on Twitter. The Department of Design and Construction is the City’s primary capital construction project manager. In supporting Mayor de Blasio’s long-term vision of growth, sustainability, resiliency, equity and healthy living, DDC provides communities with new or renovated public buildings such as such as firehouses, libraries, police precincts, and new or upgraded roads, sewers and water mains in all five boroughs. To manage this $13 billion portfolio, DDC partners with other City agencies, architects and consultants, whose experience bring efficient, innovative and environmentally-conscious design and construction strategies to City projects. For more information, please visit nyc.gov/ddc.